For those of us who love ancient typewriters, the greatest finds are often found at garage sales, thrift shops or the bottom shelf of old hardware stores in the hills. The problem with these finds is that, almost without variation, they are filthy. Whether they are in great condition or if they are fixer-uppers, they all need good cleanings before we know what to do next. Wipe down the surface of the typewriter with a damp white cotton cloth. 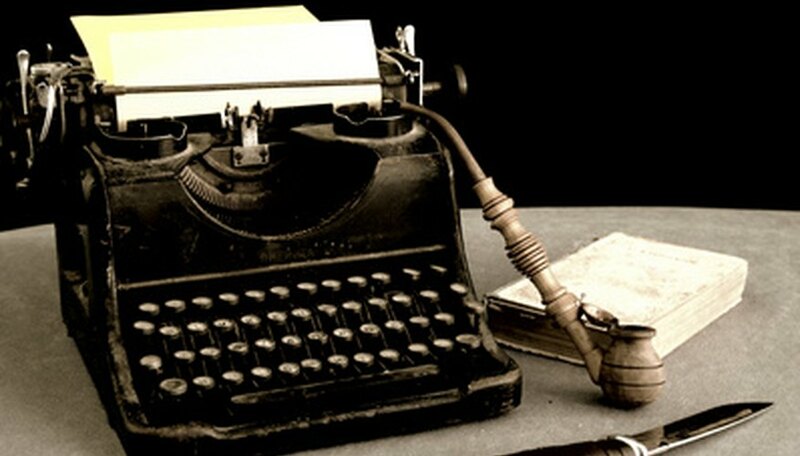 If your typewriter has glass panels on the sides, clean them up with a spray of vinegar and a white cotton cloth. If your machine has pin striping or is an older example, be aware that even the mildest of cleansers, such as Soft Scrub, may tend to strip paint away, so be very careful in your selection of cleaners. White vinegar is very mild and will not damage most painted surfaces. If your typewriter has an action cover, a snap-off cover over the ribbon spools and typebars, remove it and wipe down the underside of the cover if necessary. Put the cover aside, and address the interior of the typewriter. Carefully remove the ribbon spools and put aside. If the ribbon is in good condition, it may be re-inked. If not, depending on the age, make and model of the typewriter, replacement spools may be purchased, or the old spools may be wound with fresh ribbon. Wipe down the interior of the typewriter with a damp white cotton cloth to get rid of the major grime, removing anything that should not be there (cobwebs, garage dirt, and so on). Brush the image faces of the typebars, cleaning out dirt, dust and inky buildup using a toothbrush or typewriter brush. Use white vinegar to assist as necessary. Use the cotton swabs and white vinegar to assist in cleaning out the faces of the typebars. Use the vacuum cleaner wand to remove any loose particular matter that may have settled into the action of the typewriter. Allow the action to thoroughly air dry prior to reassembling. When dealing with post-1945 era typewriters, the paint and finishes are generally quite durable and will hold up to mild cleansers well. When dealing with older machines, be very considerate of the painted finishes, as even mild cleansers may strip off the older paints. This is especially true if the paint is flaked.